Certified Information Systems Security Professional (CISSP) is one of the most prestigious globally-recognized certifications for information security professionals. It’s no wonder that preparing to pass the exam and become CISSP certified is not an easy task. To help you prepare for and pass the CISSP exam with less effort, we created this CISSP study guide (.pdf). Even better, it’s free to download, so there’s no reason not to get started on the road to certification today. Each module also includes some hands-on exercises and detailed explanations of the right answers to help you get a feel for the real exam. Maybe you’ve already taken a class, read the official CISSP Common Body of Knowledge (CBK) or gone through a thousand practice test questions, and now you’re wondering if you are ready. This CISSP study guide pdf will help you accurately assess your knowledge of the eight domains. Alternatively, if you are just starting your CISSP certification journey, reading the guide will help you determine which domains you need to focus on and how much additional time you need for learning. 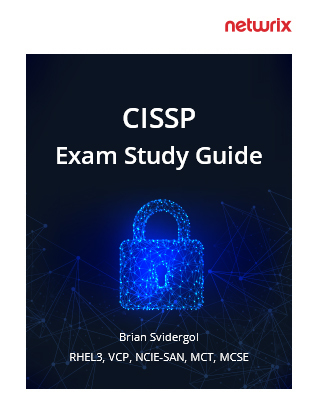 Though the CISSP free eBook is meant to supplement other study materials, it is a great preparation tool that enables you to review a lot of material in a short amount of time and maximize your chances of passing the CISSP exam on the first try.